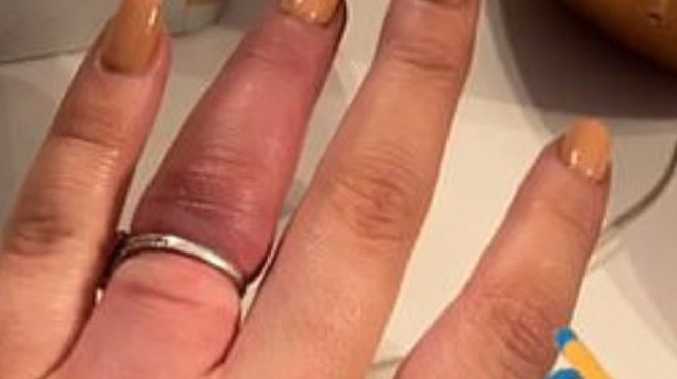 A desperate pregnant woman was forced to cut off her $900,000 engagement ring when it dangerously cut off circulation to her finger. 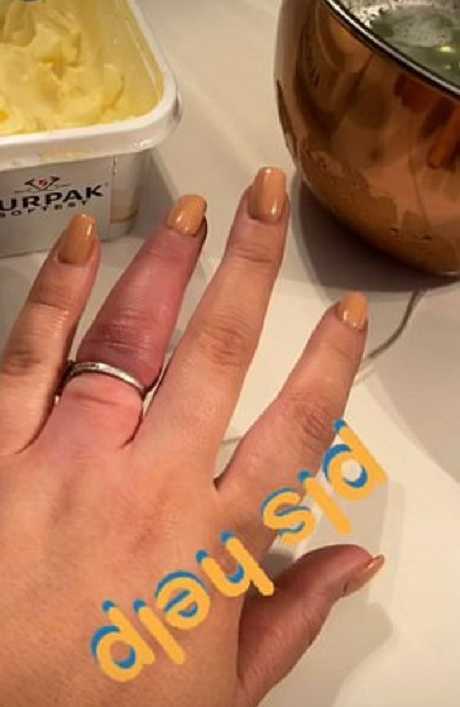 The young mum-to-be - who is engaged to British soccer star Jordan Pickford - tried everything from butter to washing up liquid to help the bling slide off her finger. The desperate woman was forced to cut off her $900,000 engagement ring when it started cutting off circulation to her finger. "We've been to the jewellers for the chop. 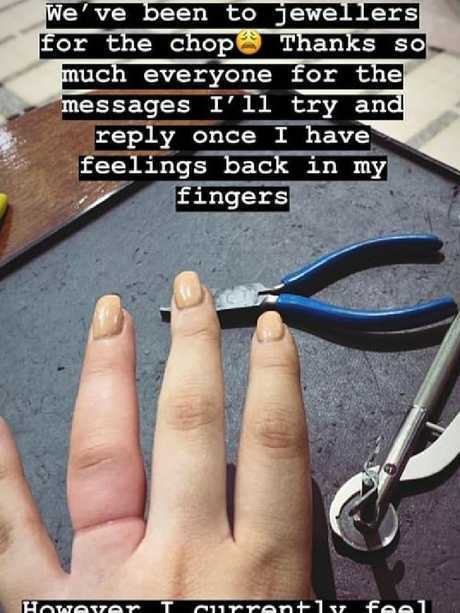 Thanks so much everyone for the messages I'll try and reply once I have feelings back in my fingers," she wrote, over a photo of her hand, showing her traumatised red wedding finger. Luckily, the expectant mum saw the funny side, telling concerned followers she felt like "Edward Scissorhands" after having the tight piece of jewellery removed. The ring was given to her in June 2018 from her soccer star fiance. "However I currently feel like Edward Scissorhands and can't even butter a slice of bread." Over the top she had written: "Please help." In Ms Davison's case, it appears to have caused her ring to cut off circulation to her finger, leaving it numb and turning it purple. Pickford is one of the world's most expensive goalkeepers - he signed on for Everton for around $50 million in 2017. So they're probably not too worried about the cost of getting the ring repaired. 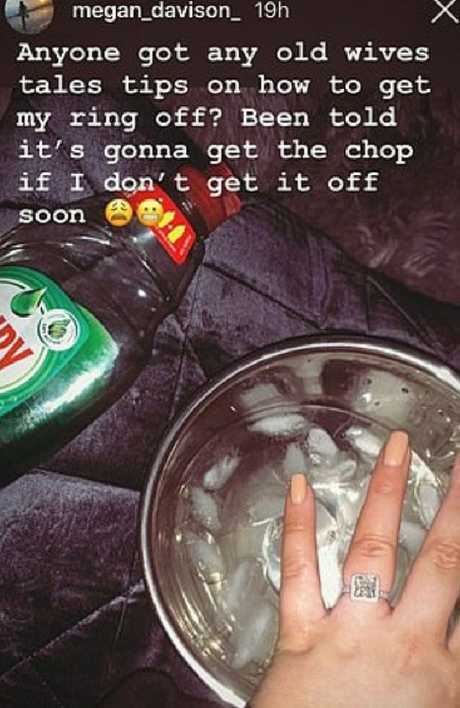 Megan Davison tried everything to get the diamond ring off, including butter, ice and washing up liquid. But had to be chopped off as it cut off circulation to her finger.